I’ve known a lot of people in leadership positions who made their employees uncomfortable. All of us could share multiple examples of how a manager or supervisor went well beyond discomfort and propelled us into misery. However, did you know that making an employee uncomfortable can be an act of genuine concern and wellbeing for the employee? If you are one of the two people who consistently read my blog you know I am employee-centric and will often call-out employers and so-called leaders who fail to lead without the awareness of the humanity in their human resources. However, you might find an apparent disconnect with my contention that the most effective leaders purposefully—intentionally—force others into discomfort. 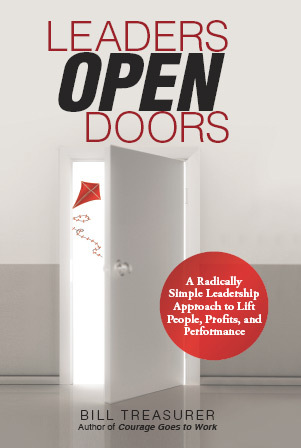 This thought became an addition to my quiver of leadership traits after listening to Bill Treasurer share insights from Leaders Open Doors, his book about how leaders help people and organizations by creating opportunities for growth. Treasurer is adamant that leaders have the responsibility for noticing, identifying and creating opportunities for the benefit of people, organizations and society. Following his presentation, I picked up a copy of the book and was drawn to the chapter on Purposeful Discomfort. Treasurer asserts “We grow, develop, and progress by pursuing opportunities that put us outside of our comfort zone.” While he punctuates how we should seek out uncomfortable situations which will open doors for our own growth, he makes a good case for placing others in uncomfortable situations. If we want to see others grow, develop and mature, we will deliberately give them responsibilities that force them to expand their experiences and reveal their strengths. Ginny Rometty, the CEO of IBM, understands this too, as noted when she writes “Growth and comfort do not coexist.” The best employee development plans include premeditated discomfort. The best employee development plans include premeditated discomfort. Putting others in an uncomfortable—but growth oriented—opportunity may mean asking someone to lead a meeting or take the reins on a critical project for a client. It may be asking the employee to make a presentation or assume a new challenging role. An employee may be hesitant to take on an uncomfortable responsibility because—honestly—there is some measure of possible failure. However, as Treasurer affirms, there are many benefits of a leadership style that incorporates purposeful discomfort. I am grateful for leaders who put me in discomfort for the sake of my own development. They gave me confidence. They gave me courage. They helped me discover my strengths. And, they gave me an example to follow as I seek to do the same for those I am called to lead.